"I started out as a mechanics flunky at Hudson Bay Air Transport at the age of 13 years. Worked weekends and holidays cleaning grease, fetching tools, testing spark plugs, etc. ; in payment I got to ride the right seat of the Norseman they had at that time. Even got in a bit of dual. In 1946 I went to work, again after school and holidays, for Johanneson Flying Service. Konnie Johanneson was an early operator in Winnipeg. Flight training and minor charter work. He set up at Channing, Manitoba on Schist Lake, the water base for aircraft operating in and out of Flin Flon. Started with a Waco Custom (I think was the model) CF-BDJ on skis and added A Stinson 104, a Cessna 140 CF-ELJ, a Norseman CF-BZM, and two Cessna Cranes CF-EZA & CF-EZG. 'EZA was a T-50 Heavy wing and we used it on both skis and floats.
' EZG had the light wing version and was licensed for skis or wheels only.
' JFS hauled fish from Reindeer Lake and prospectors to sites in and around the Lynn Lake area when Sherrit-Gordon Mining Co. had made a big nickel strike there. In 1948 I joined the Royal Canadian Air Force and trained as a Communications Technician. I spent two years at that and then had to get a compassionate discharge and return to Flin Flon after my Father died suddenly at age 42. I worked underground in the mines there while my Mom got reestablished. In 1952 I re-joined the RCAF. Initial training on Harvards at Claresholm, Alberta, where my roommate was a Dutch trainee, Noel van der Haar. After 9 months I went to Saskatoon, Saskatchewan for training on Beech C-45s and B-25s. Then to the Air Navigation School at Winnipeg, Manitoba. There I flew trainee navigators and radar operators around western Canada. In 1955 I was transferred to Rockcliffe Air Base at Ottawa, #408 (Photo) Squadron. There I checked out on the DHC-3 Otter on wheels, skis and floats; the DC-3 Dakota, and managed some time on the Cansos and Lancasters, but not enough to qualify. In August 1957 I moved to #101 Comm. Flight at the Canadian Navy base at Shearwater(Halifax) Nova Scotia. There it was Daks and Expeditors. In Nov. '58 I left the Air Force. Spent all the summer of '59 flying an Otter for Superior Airways out of Thunder Bay Ontario. Mostly in the high arctic regions with bases in Cambridge Bay and Resolute Bay. November '59 I joined Hudson Bay Air Transport in Flin Flon. With them I flew Beavers. Otters, Mallard & Cessna 185. In 1968 they decided to get into corporate jets and I was promoted to a DH-125 CF-OPC, based in Winnipeg and Toronto. After two years the bean counters decided jet flying was too rich for the Company and I was out of a job! I filled in for awhile on a DC-3, flying from Hamilton, Ontario for Austin Airways. Mostly hauling goose hunters to and from the east coast of Hudson Bay: Cape Jones, Great Whale River, Fort George. CF-AAM and CF-AAB. I then was hired by the then Department of Transport to work as an Aircraft Accident Investigator out of Toronto. Interesting, and several stories came out of that exercise that lasted 4 years. Then one day HudBay called and offered me a job flying an IAI 1123. I jumped at that and went to Tel Aviv to pick up a new one: C-GJCD. Man-Oh-Man, I could tell you about the problems we had with that beast!!! Finally after losing an engine on a gross weight take-off at Laguardia I convinced them to upgrade to a new 1124. C-GMBH was a pilot's dream. Along the way HudBay decided to move their head offices to New York City and we setup the flight department at Morristown, N.J. in 1983. That went well until 1986 when they decided for various reasons to move the offices and flight operations to Sioux City, Iowa. Rather than move there I opted for an extremely generous severance and pension package and my family and I moved back to Canada. I did some part-time, charter work out of Toronto on Citations and Westwinds, but finally decided to hang it all up in 1990, while I was still ahead of the game. My logbooks show an uncooked 18,854 hours!" "Norseman CF-BFT, s/n 17, went into service in January 1939 with Hudson Bay Air Transport, a wholly-owned company of Hudson Bay Mining & Smelting Co. Ltd. of Flin Flon, Manitoba. Alex More was the first pilot hired and went on to become Superintendent & Chief Pilot of HBAT. Alex retired in April 1967 and passed away in June 1977." 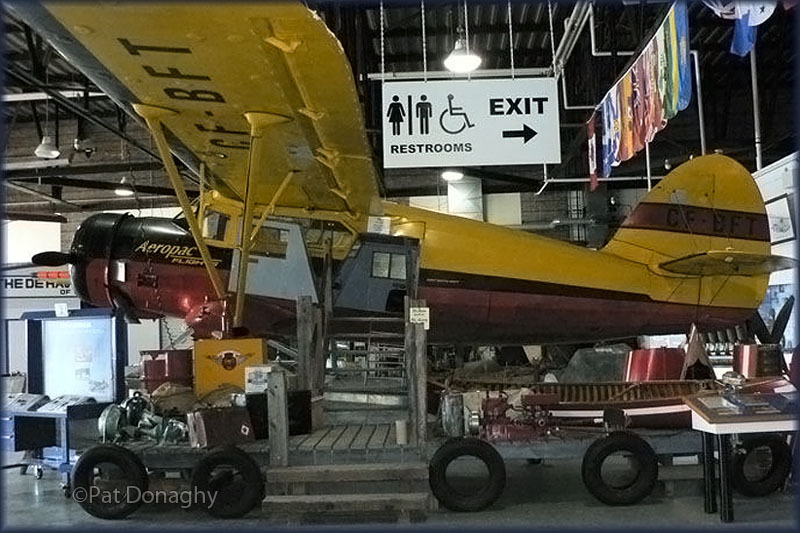 "CF-BFT is presently on display at The Bushplane Heritage Center at Sault Ste Marie,Ontario. It is the oldest still serviceable Norseman in the world. Hudson Bay Air Transport(HBAT) was a wholly owned subsidiary of Hudson Bay Mining & Smelting Co. (HBM&S) of Flin Flon Manitoba. Their first aircraft was a Mk IV Norseman s/n 17, registered as CF-BFT, purchased new in February 1939. 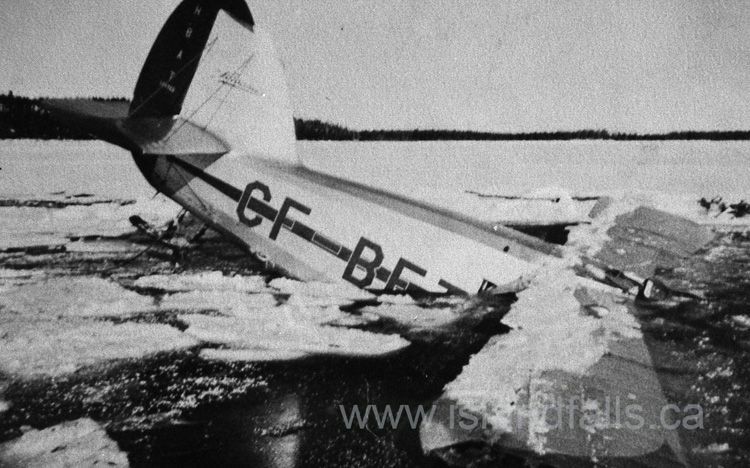 On the 21 Jan 1941, while landing on the Cochrane River (57 51 30 N 101 07 29 W) CF-BFT went through the ice to the leading edge of the wings. Alex More and two passengers escaped and then Alex took off all his clothes and dove into the river to salvage their emergency box of supplies. They spent three days there before searchers picked them up. Pilot and passengers escaped unharmed. As it was wartime and mineral exploration and development had high priority it was essential that the aircraft be salvaged and returned to service as soon as possible. The salvage of the aircraft was a very unique operation. Since there were no trees big enough to construct an 'A' frame for hoisting, it was decided to sink the aircraft to the bottom of the river and skid it ashore! A crew of men were flown in from Flin Flon and several local natives hired to help. Once ashore a huge canvas, tent-like cover was constructed to enclose the entire aircraft. Several wood-burning heaters were kept constantly burning to thaw out the aircraft. There was of course no Herman Nelson heaters and no electricity. Environmental temperatures ranged between -30 and -45 degrees F.
As thawing progressed the cylinders, magnetos, starter, radios, instruments and generator were removed and reconditioned. Fuel and oil was drained. With hand drills, holes were drilled at the lowest points of all the structural tubing to drain the water therein. 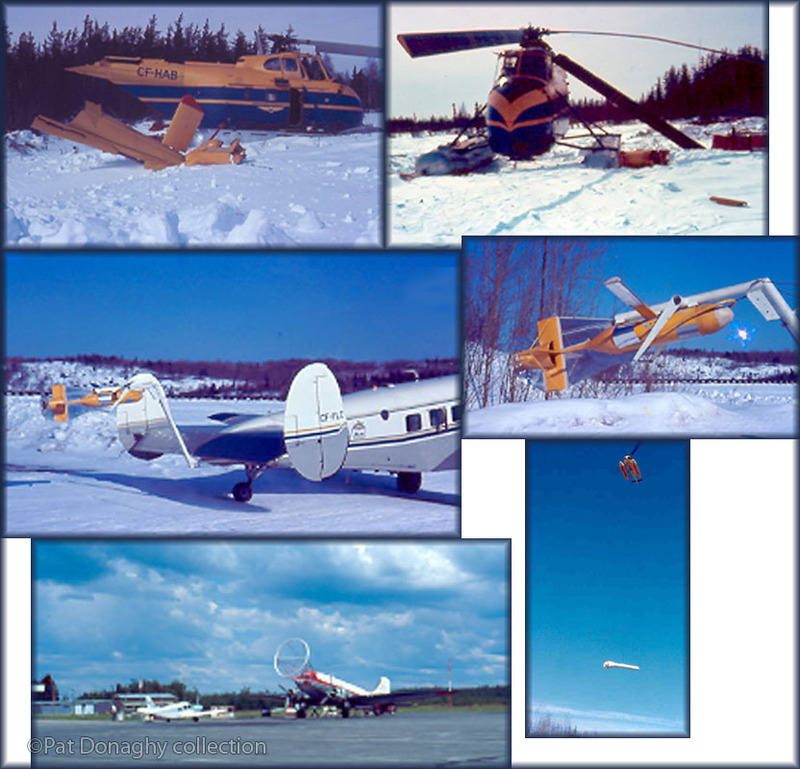 Eventually the aircraft was skidded back onto the now well frozen river surface and flown out to Lac du Bonnet, Manitoba for a complete overhaul. The overall logistics of supplying all the equipment required, the accommodation and feeding of the workers at that remote and inhospitable location is mind boggling. As an example two men were employed all day, everyday just cutting the wood to feed the heaters. In the meanwhile to replace CF-BFT, another Norseman s/n 18, and registered as CF-BFU was purchased from the Norwegian Air Force, who were based at that time at 'Little Norway' at Toronto Island Airport. HBAT went on to operate until 1982, when the hangar doors were finally closed. Thousands of hours were flown in Norseman, Beaver, Otter, Cessna Crane, Harvard, Grumman Mallard, Cessna 185 fixed wing aircraft and Sikorsky S-55 and Fairchild-Hiller FH-1100 helicopters. There was never a fatal or serious injury incurred during the entire history." "Many may never have heard of Hudson Bay Air Transport because it was a non-commercial company and flew ONLY for Hudson Bay Mining & Smelting Company Ltd.
And they provided transportation to and from Island Falls, Saskatchewan on the Churchill River, where the hydro-electric plant was located that provided electrical power to the mining operation and the domestic needs of the Town of Flin Flon. In 1953 they purchased new Sikorsky S-55, CF-HAB. A winch and recording equipment were installed and when flying, a fibreglass 'bird' about 30-feet long by 18-inches diameter was towed suspended on a cable 100-feet below the chopper. This machine was also used for slinging power line poles to replace those destroyed when a forest fire burnt down sections of the line. This chopper was destroyed, 1st April 1967 during an engine run-up when a canvas cover became entangled in the rotor mechanism. It was replaced by a new Fairchild-Hiller FH-1100. As survey technology became more sophisticated it was decided to use a Beechcraft Super 18, CF-FLC, that had been serving as an executive transport. The pictures will show various models of a 'bird' that were built and tested and the final version as installed and successfully flown over many line miles. The 'bird' was nested in a boom for takeoff and landing. Once over the designated survey area the boom was rotated over and around the vertical stablizer and the cable from an on board winch was streamed out 100-feet. In later years a DC-3, CF-IOC, was used for airborne surveys." Something about Airborne Geophysical Surveys..
"Anglo-American Corporation of Johannesburg, South Africa bought the controlling interest in Hudson Bay Mining & Smelting about 1955. They sold their interests to HudBay Minerals in December 2004. 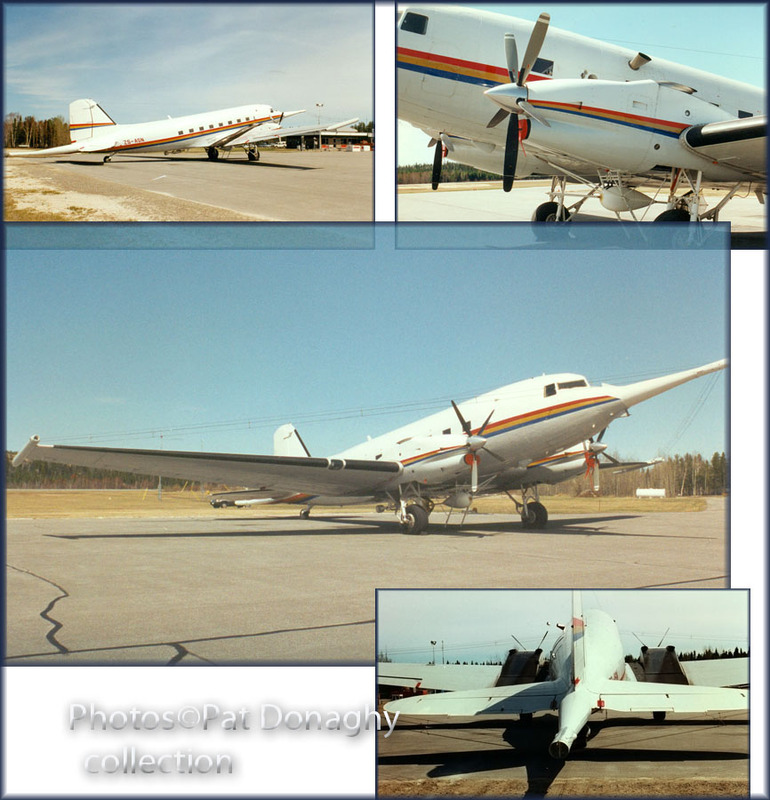 In May 1994 Anglo based a modified DC-3, ZS-ASN at the Bakers Narrows airport at Flin Flon, Manitoba. For the best part of two summer seasons it carried out extensive geophysical survey flight over Northern Manitoba resulting in the discovery of several ore bodies of which at least three were developed in productive mines. The aircraft was powered by two P&W PT-6 turbo-prop engines and had a third smaller turbine engine on-board to power the electronic survey equipment. A 4-wire cable ran from nose-to-wing tip-to-tail-to-wing tip-to-nose. Two 'birds' were suspended by cable while the aircraft was in flight. These pictures were taken by me on 20 May 1994 at Bakers Narrows airport. " I came across ZS-ASN in Johannesburg in 2004.